Science is much closer to our daily lives than many of us believe. Some of the simplest phenomena and everyday occurrences which do not strike one as of any particular interest, abound with scientific explanations. WHO would imagine, when watching soldiers marching across a bridge, that they do so under orders to “break step.” If this were not done there would be a rhythmic motion set up in the bridge structure—a steady tramp-tramp—which would likely disrupt any small bridge and perhaps even a very large one (Fig. 1). Can a submarine remain stationary at any desired level? The answer is that it cannot, unless a slight headway is maintained or water is admitted to and discharged from the trimming tanks. A submarine cannot find a state of hydrostatic equilibrium or a point at which all pressures are equal. 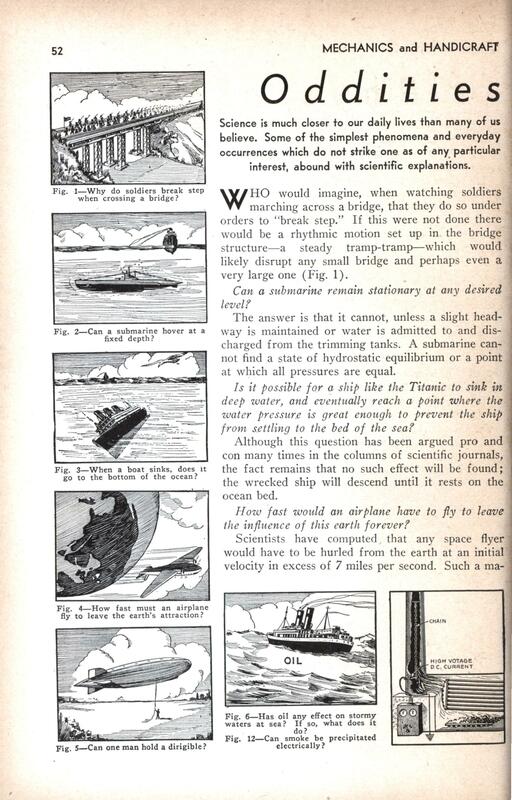 Is it possible for a ship like the Titanic to sink in deep water, and eventually reach a point where the water pressure is great enough to prevent the ship from settling to the bed of the sea? Although this question has been argued pro and con many times in the columns of scientific journals, the fact remains that no such effect will be found; the wrecked ship will descend until it rests on the ocean bed. How fast would an airplane have to fly to leave the influence of this earth forever? Scientists have computed, that any space flyer would have to be hurled from the earth at an initial velocity in excess of 7 miles per second. Such a ma- chine would reach the moon in less than 10 hours. (However, gradual acceleration could effect a departure, without such a high starting speed.) Could one man hold a Zeppelin? 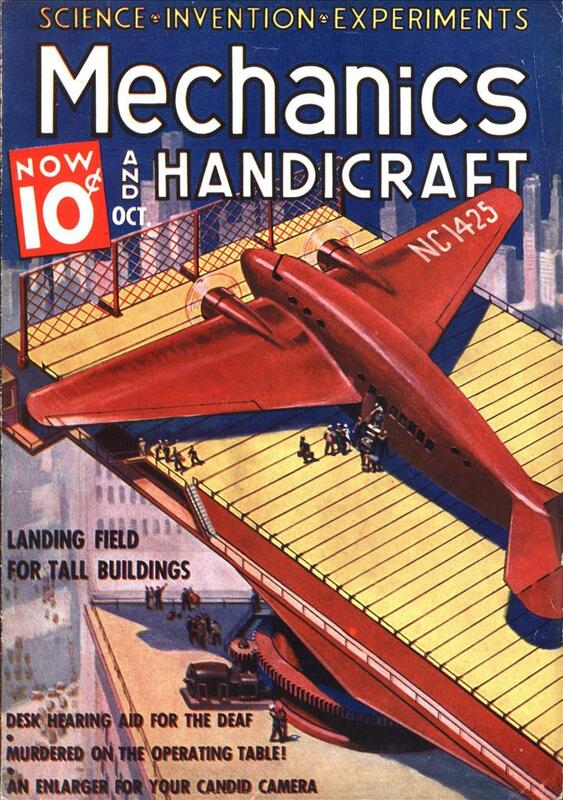 The answer is yes, if the ship is carefully trimmed and balanced, as is the case when she is just brought out from the hangar preparatory to a flight. Does putting oil on the water help to quiet angry waves? Yes, this is a regular recognized practice at sea when the waves are running high and a ship is in distress. The oil helps to prevent white caps, but it does not stop the general swell of the waves. Does the rotation of the earth cause wear on certain banks of a river? Yes, theoretically, at least. There doesn’t seem to be any measurable proof. In rivers running north and south, in the Northern Hemisphere, there is a tendency to wear away right-hand banks, as shown in the diagram in Fig. 7, due to the rotation of the earth. In the Southern Hemisphere it is the left-hand banks that receive the most wear. How does science help in releasing a tight pulley.’ A usual method of removing a pulley is to apply heat from a blow-torch to the pulley and ice bags to the steel shaft. The resulting contraction and expansion often permit the removal of the pulley when it otherwise refuses to yield. Fig. 9 shows one way to stop a “flue” fire, simply by placing a cap or pan over the top of the chimney and thus checking draft of air through the chimney. Another trick is to put salt in the fire in a stove con- nected with the burning flue; the gases gen-crated help to snuff out the flames in the chimney. Fig. 10 shows how violins and other high-pitched instruments are placed near the “mike” in broadcasting, while the bass violins, etc., are placed further back. The low notes, emitted by bass instruments, have more energy in them, or are stronger than the high-pitched notes coming from the flute, violin, etc., hence, in broadcasting studios, the majority of wind instruments are usually placed further away from the “mike,” as are drums, etc. An interesting and everyday occurrence in homes and offices is the vibration of a metal picture frame, or other similar object, when a certain note is sounded on the piano, or radio (Fig. 11). This is due to the fact that the frame has a natural frequency corresponding to the note struck, hence it vibrates sympathetically. It is not generally known that if a high voltage direct current is passed through a wire grid in a chimney, smoke from the boilers can be eliminated. The high voltage electrical charges cause the carbon particles, comprising the smoke, to become charged and they are precipitated to the bottom of the stack. Fig. 13 shows an interesting problem which public address engineers have to conjure with at times. A person sitting a certain distance from the speaker’s platform may experience the unusual sensation of hearing the speaker’s voice coming out of the loudspeaker before he hears the natural voice coming from the stage. This is due to the fact that sound travels only at about 1100 feet per second in air, while the electrical current, carrying the voice from the “mike” to the loud speaker, travels at 186,000 miles per second. Consequently, good judgment has to be used by the engineers in planning P. A. systems. If a tank full of water has 3 openings, as shown in Fig. 14, the middle jet will produce the longest stream. Does smoke blowing downward from a chimney indicate rain? No. This is an old theory, but it has little to recommend it. Smoke rises because of its higher temperature. If the outside air is as warm as the smoke, or if the smoke is “chilled,” as on a moist, humid day, the smoke will fall. In a double-track railroad running north and south there is a greater wear on the outer rails. This is due to the earth’s rotation. Any train, in the northern hemisphere, running north has a greater eastward motion at the point of its location a moment before than at the moment the analysis is made. Hence, in case 1, the track presses harder against the train, causing greater wear on the outer rail, while in case 2, the train presses more strongly against the outer rail, causing extra wear there. Why is air pumped down to divers under the water? Air is pumped through a hose constantly to submerged divers partly to counter-balance the pressure of the water. The greater the depth the higher the air pressure pumped to him. A problem in weighing: If a druggist found that someone had taken some of the weights for the scale and only left a 2-oz. and a 5-oz. weight, how could the druggist weigh 1 oz. of powder? He puts the 5-oz. weight in one pan, in the other pan he puts the 2-oz. weight and enough powder to balance the scales. He now has 3 oz. of powder in the pan. Then he puts the 2-oz. weight in one pan and the powder in the other, removing sufficient powder to balance the scale. The 1 oz. of powder removed to effect a balance will be the quantity desired. The principle of inertia is well shown in the simple trick of striking the end of an axe handle with a hammer in order to drive the axe more firmly on to the handle, as shown in Fig. 19. When the end of the handle is struck as at “H” the steel axe, due to its inertia, tends to preserve its position and thus the wooden handle is driven more firmly into the axe. From what depth can an ordinary pump lift water? About 26 feet is the maximum lift for an ordinary pump. If a force-pump is employed, then a check valve is placed well down in the pipe so as to be fairly close (18 to 24 feet) to the water, this valve being operated by a rod inside the pipe. Theoretically, the pressure of the atmosphere will raise water about 32 feet when a vacuum is established inside the pump lift pipe, but due to losses in the valves, etc., about 26 feet is a good working limit. An interesting every-day problem concerns cars fitted with a vacuum-tank system for “sucking” gas from the tank at the rear. These sometimes get out of order, or leak, or they may have been drained while making repairs on the car. A trick worth remembering is that gas may be forced up into the vacuum tank by exerting air pressure on the pipe where the tank is ordinarily filled, as shown in Fig. 21. With a piece of rubber hose or inner tube, air may be blown into the tank from the mouth or from a tire pump.